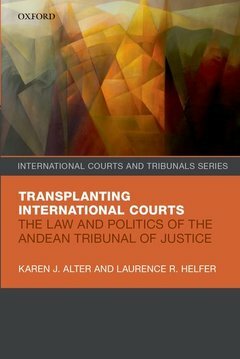 Transplanting International Courts Alter Karen J., Helfer Laurence R.
Auteurs : Alter Karen J., Helfer Laurence R.
Transplanting International Courts: The Law and Politics of the Andean Tribunal of Justice provides a deep, systematic investigation of the most active and successful transplant of the European Court of Justice. The Andean Tribunal is effective by any plausible definition of the term, but only in the domain of intellectual property law. Alter and Helfer explain how the Andean Tribunal established its legal authority within and beyond this intellectual property island, and how Andean judges have navigated moments of both transnational political consensus and political contestation over the goals and objectives of regional economic integration. By letting member states set the pace and scope of Andean integration, by condemning unequivocal violations of Andean rules, and by allowing for the coexistence of national legislation and supranational authority, the Tribunal has retained its fidelity to Andean law while building relationships with nationally-based administrative agencies, lawyers, and judges. Yet the Tribunals circumspect and formalist approach means that, unlike in Europe, community law is not an engine of integration. The Tribunals strategy has also limited its influence within the Andean legal system. The authors also revisit their own path-breaking scholarship on the effectiveness of international adjudication. Alter and Helfer argue that the European Court of Justice benefitted in underappreciated ways from the support of transnational jurist advocacy movements that are absent or poorly organized in the Andes and elsewhere in the world. The Andean Tribunals longevity despite these and other challenges offers guidance for international courts in other developing country contexts. Moreover, given that the Andean Community has weathered member state withdrawals and threats of exit, major economic and political crises, and the retrenchment of core policies such as the common external tariff, the Andean experience offers timely and important lessons for European international courts. Karen J. Alter, is a Professor of Political Science and Law at Northwestern University, permanent visiting professor at the iCourts Center for Excellence, and co-director Research Group on Global Capitalism and Law. Winner of the Berlin Prize and a Guggenheim fellow, Alter is author of the award-winning The New Terrain of International Law: Courts, Politics, Rights (Princeton University Press, 2014), The European Courts Political Power (OUP, 2009) and Establishing the Supremacy of European Law (OUP, 2001) and more than forty-five articles and book chapters on international law. Alter is member of the New York Council on Foreign Relations, the Executive Committee of the American Society of International Law, and serves on the editorial boards of the journals International Organization, the American Journal of International Law, International Studies Review, Law and Social Inquiry, and the Journal of International Dispute Settlement. Laurence R. Helfer is the Harry R. Chadwick, Sr. Professor of Law, co-director of the Center for International and Comparative Law, and a Senior Fellow with the Kenan Institute for Ethics at Duke University. He also serves as a Permanent Visiting Professor at the iCourts: Center of Excellence for International Courts at the University of Copenhagen, which awarded him an honorary doctorate in 2014. Professor Helfer has coauthored three books and more than seventy scholarly articles on his diverse research interests relating to the interdisciplinary analysis of international laws and institutions, which include international courts and tribunals, treaty design, international human rights, and international intellectual property law. He is a member of the Board of Editors of the American Journal of International Law and the Journal of World Intellectual Property.